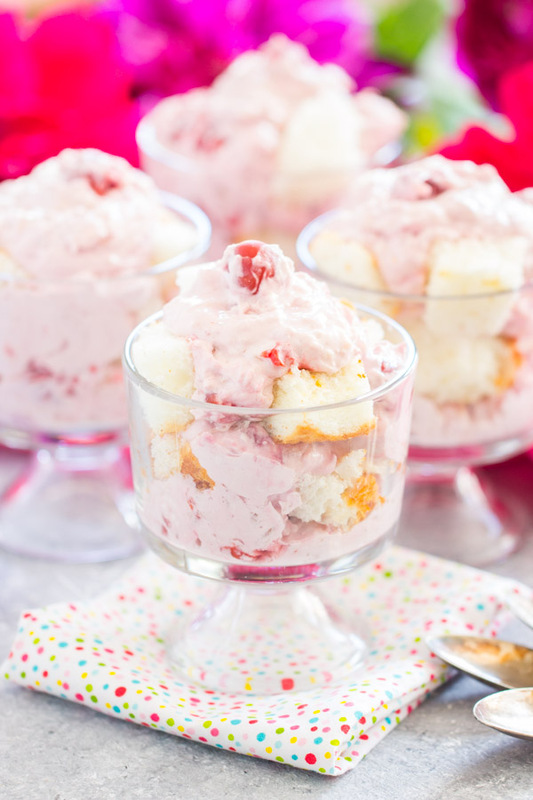 Bites of light, airy angel food cake are layered with sweet, fluffy, cherry-pineapple Pink Stuff filling in these Pink Stuff Parfaits! 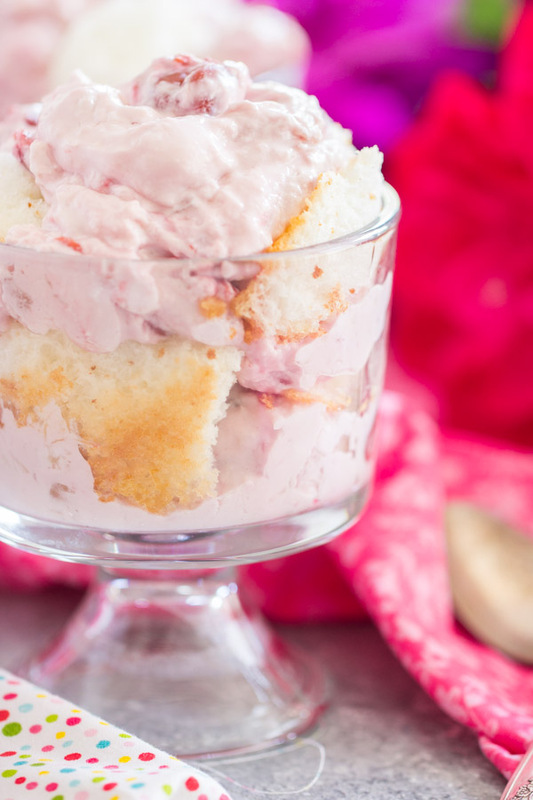 Pink Stuff Parfaits are quick, easy, and make for a light, refreshing summer treat! What is Pink Stuff, you ask? I didn’t think another person in the world would know what the heck ‘Pink Stuff’ is – I thought that was just a name my family gave it, but it’s actually an official recipe name. I found out recently that people are searching those terms: ‘Pink Stuff recipe.’ Isn’t that funny? Had you heard of Pink Stuff before I posted this Pink Stuff recipe over the holidays?? Anyway, Pink Stuff is a quick and easy, 4-ingredient dessert salad or holiday side dish featuring cherry pie filling and pineapple as key flavors. 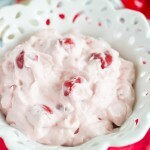 It’s sweet, light, and fluffy, and makes for a great light dessert or refreshing fruity salad. We make it for every holiday and family get-together. Seriously… every single one. We love it. I was making it for Easter, and the thought occurred to me that Pink Stuff would make for a really delicious no-bake pie filling. Why not? That Pink Stuff recipe has all the qualities of a great pie filling, but without a crust, and it just needed to be a little sturdier. 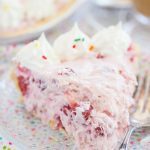 I added cream cheese, subtracted a bit of whipped topping, piled it into a prepared crust, and it adapted perfectly into this No-Bake Pink Stuff Cheesecake Pie. Post-Easter, we had A LOT of Pink Stuff leftover. The Pink Stuff recipe makes quite a lot, and although we usually have a pretty good crowd, there’s inevitably a decent amount of leftovers. There’s always so much food, so we often have a lot of leftovers of everything! I had the idea to make these Pink Stuff Parfaits with leftover Pink Stuff. I baked an angel food cake from a box (or you could pick one up store-bought), cut it into bite-sized pieces, and layered the angel food cake bites with Pink Stuff. 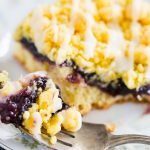 You only need about half the angel food cake (to make 6-8 small parfaits), so freeze the rest, or serve it with this Easy Blueberry Compote Recipe or with some kind of curd – I have lemon curd recipes in these posts: Lemon Cream Pie Cookie Cups or Lemon Blueberry Cheesecake. I have key lime curd in the recipe for these Key Lime Macaroon Thumbprints. Any kind of curd! 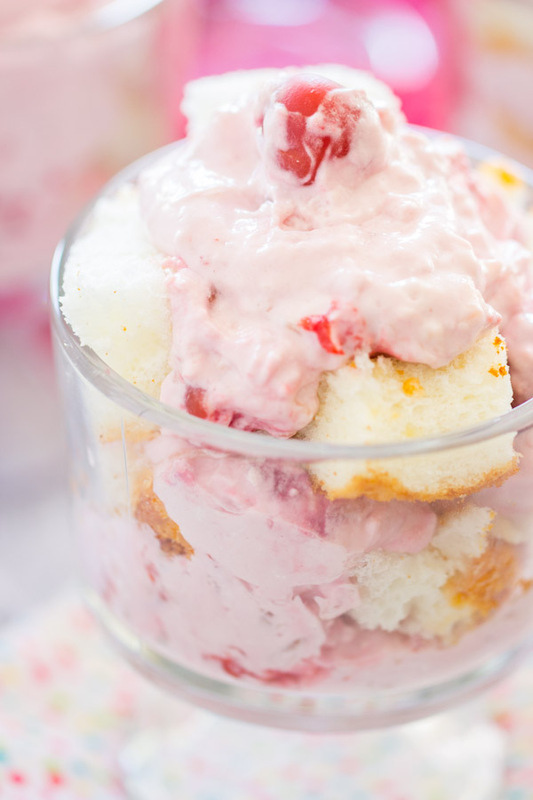 These Pink Stuff Parfaits are a great summertime treat because they’re sweet, fruity, light, and refreshing. 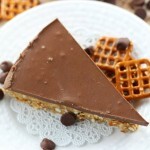 Nothing heavy or weighty, but still sweet and dessert-like. They’re satisfying as a light dessert in this hot weather! 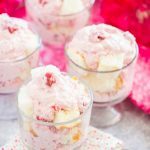 Give these Pink Stuff Parfaits a try, and let me know what you think! 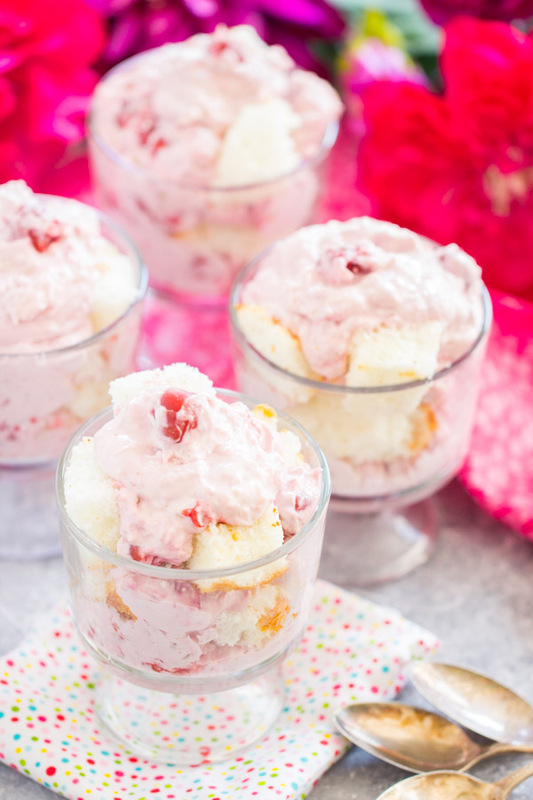 Bites of light, airy angel food cake are layered with sweet, fluffy, cherry and pineapple Pink Stuff filling in these Pink Stuff Parfaits! 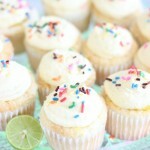 They're so easy and simple, but a lovely treat! Prepare and bake angel food cake according to package instructions. Cool completely, and cut into bite-sized chunks. Stir together crushed pineapple, cherry pie filling, sweetened condensed milk, and whipped topping. 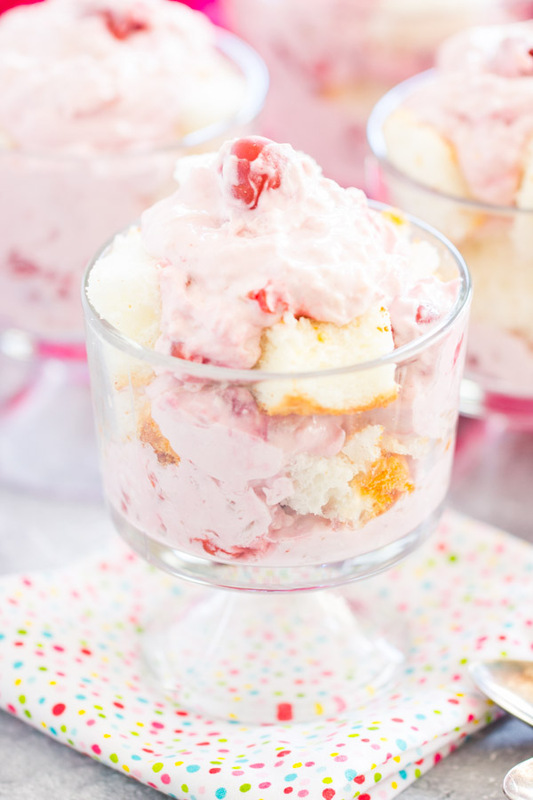 In parfait glasses or jelly jars, layer pieces of angel food cake with heaping tablespoonfuls of Pink Stuff. 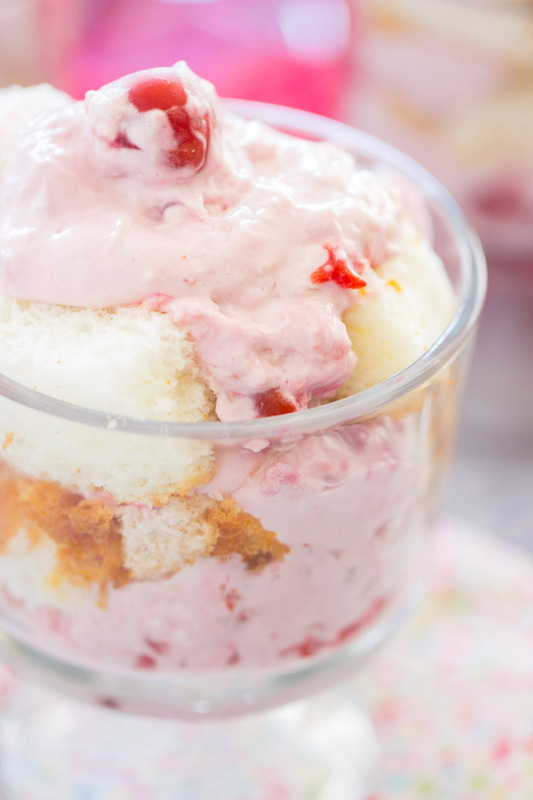 Store parfaits in the refrigerator for up to 2 days.